Languid, lovely, evocative… a melt into a sumptuous sofa, and the sonic equivalent of isolated pools of low light playing off facets of cut crystal and opulent aperitif, close sensuous voices, soft laughter bittersweet with memory at the end of an evening. A warm, layered and very human scene painted entirely with one acoustic guitar drenched with resonant chords, clear and unhurried melody lines, and shadowy blue bass notes that rise or fall in pitch or pace like a melancholy pulse. An exquisite piece of music played on an exquisite guitar, exquisitely. 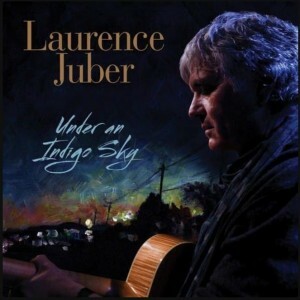 And that is just the first track on Juber’s Under an Indigo Sky, the latest CD from the two-time Grammy winner. It was mixed by Al Schmitt, who has won 19 Grammy Awards, including the Lifetime Achievement Award in 2006. As impressive as the vibrant playing is, it is the more languid performances, such as Cry Me A River with its sustained chords and un-struck string glides that truly show off the mastery of the engineer and the exceptional qualities of the guitar. While both the mellow and the vigorous selections reveal the mastery and exceptional qualities of the guitarist.